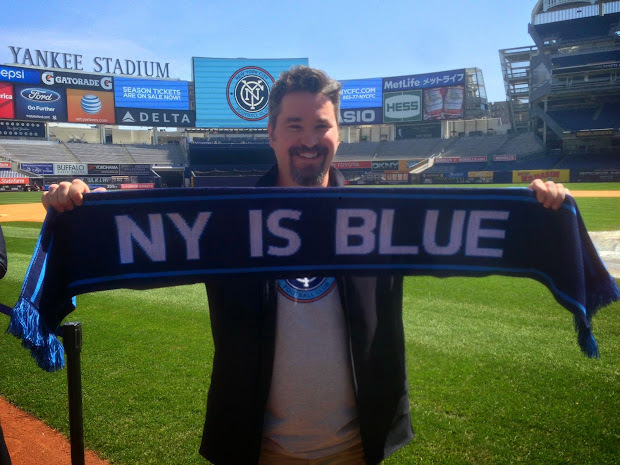 NYC is Blue: City Makes It Official: It's the Bronx for 2015! 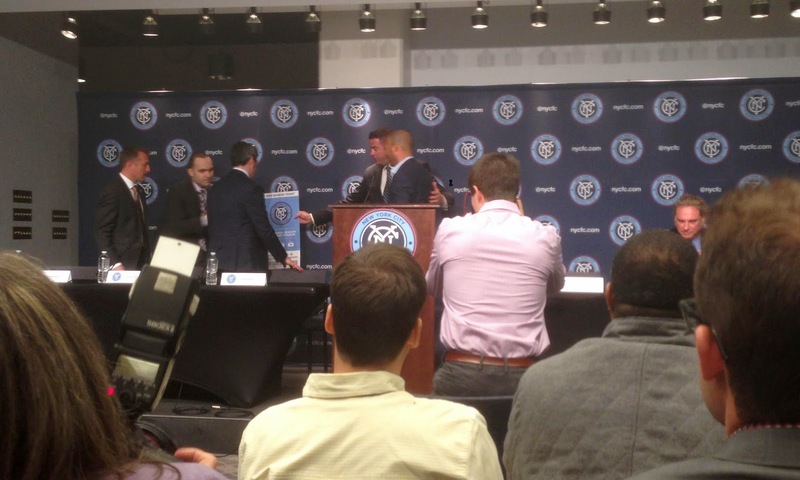 At 11:00am today, I was at a press conference in Yankee Stadium as New York City FC made two important announcements. The first was that, as was previously reported in the New York Times, they will make Yankee Stadium their inaugural home. 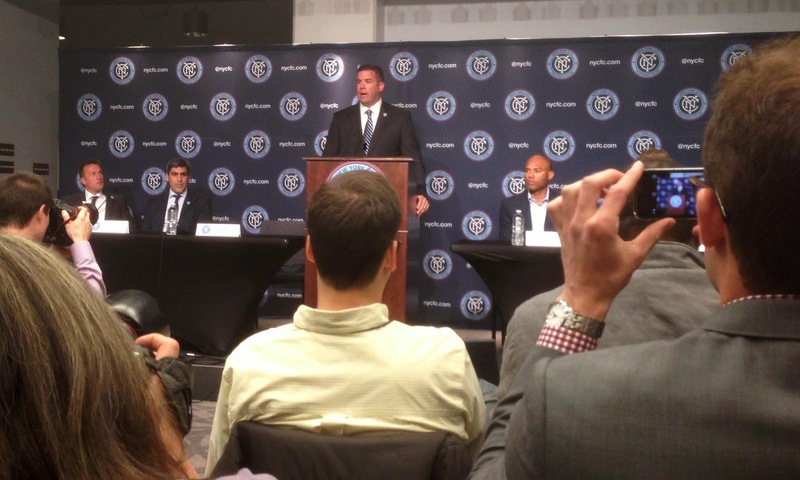 Representing City was Chief Business Officer Tim Pernetti, head coach Jason Kreis and Director of Football Operations Claudio Reyna. The Yankees were represented by their president Randy Levine, chief operation officer Lonn A. Trost and, in a surprise move, Yankee legend Mariano Rivera. The club wouldn't set a limit on how many seasons will be played in Yankee Stadium. A soccer-specific stadium within the city limits is still very much going to happen. Trost explained that the pitch layout will be substantially similar to previous football matches at the Stadium. The pitch will be 110 yards by 70. This seems narrow, but Kreis dismissed any concerns. "My personal experience — because at Real Salt Lake, at Rio Tinto Stadium, between 2009 and 2010, it was 70 yards wide — for me, that’s a comfortable width. If you start going narrower than that, 68, 66, then you have some concerns. But for me, when I was told it would be 70 yards wide, I was a very, very happy man." 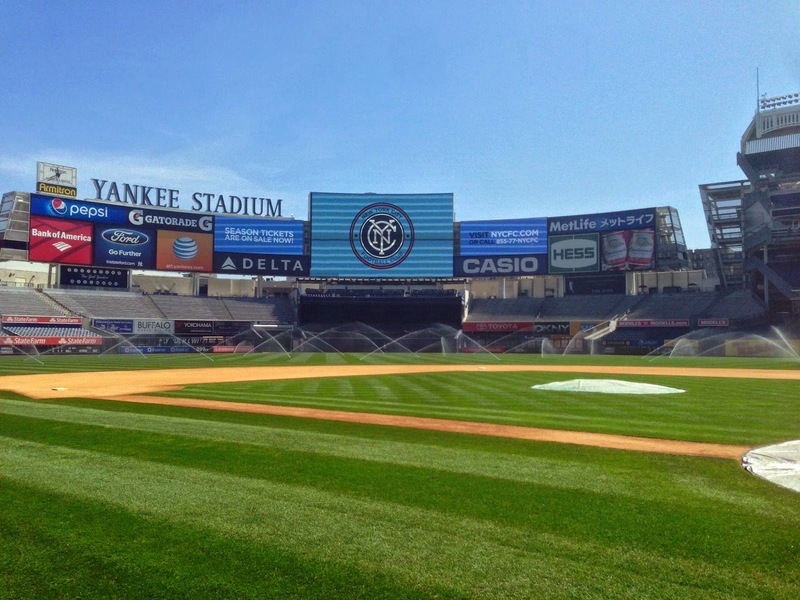 It will take the Yankee grounds crew three days to convert the baseball diamond to a soccer pitch, and three days to move back again, "two and a half days if we work all night." Although Major League Baseball has reportedly expressed some concerns about damage to the diamond during the Yankee season, Levine expressed full confidence in his crew's ability to make the transition. He reminded everyone that Yankee Stadium already hosts events from hockey to soccer to concerts. He hearkened back to George Steinbrenner's original vision for the park. "When we built this building," he said, "the Boss always wanted to keep it open year-round." As for capacity, the current plans are to close off the grandstand and terrace levels. 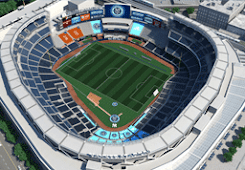 That will bring the capacity down from 49,642 to approximately 33,444 seats, more in line with the larger MLS parks (and nine thousand more than Red Bull Arena). Obviously, sightlines will be an issue. And a baseball stadium isn't a great permanent home for soccer. But still, Yankee Stadium is an iconic building, the most important sports arena in the area. There's something very cool about starting out there. It will always be a part of our history, even after we move to a permanent home. And NYCFC will likewise always be a part of the Stadium's legacy. Not to mention it's good to emphasize the Yankee part of our ownership group for a while. The club then made its second announcement of the day: season ticket sales would begin at 1:00 pm. After the press conference, we moved out onto the field. 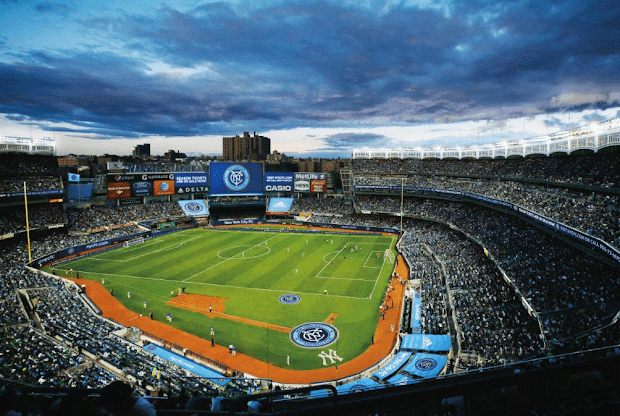 It was something, to emerge from the tunnel to see the green grass on the field, the famous white frieze along the top of the grandstand, and the new NYCFC logo fifty feet tall on the scoreboard. It was quite an experience, to stand on the warning track in front of the home dugout and imagine 33,000 soccer fans all singing in unison. I can't wait for 2015.